Session 4-2 on Dec. 01 with the 8 years old by Caroline. The Donders brain puzzle is displayed on the board (I didn’t succeed to give children explanations about the different brain area but it was still useful to give some context to the recall about neurons). We talk again about new vocabulary seen at the last session. Once reactivated, we move to talk about neural networks and we define in detail synapse, electrical and chemical connections. Neurotransmitters can be inhibitors or exitators : so we end up saying that in order to learn we need to have positive emotions and that if we are too much stressed out, connections between neurons are not efficient. We end with the reading of Mimi the microglia, the tale, in which Mimi see the birth of a new neuron in a very precise brain area. Really? so the brain continue to make new neuron ? Yes it does ! Session 4-3 Dec.08 with 8 years old by Caroline. We begin by reading the comic “cerebral plasticity”. Children were happy to see that they understand how the brain work and connections are make when we learn. The vocabulary is reactivated and its now totally assimilated by most of the children. After the reading, we come back to the cerebral plasticity and why being wrong matters to learn. Asking questions is the most important. We end this session by looking at Cline Alvarez video on brain plasticity. Children are now aware that they have a bigger neural networks than adults have. New questions arise: so are we more intelligent that adults are? Until the video explain that adults become expert thanks to a better organization of their connections with habits, exercise and repeating. No miracle, to become expert is based on repeating again and again! Once again an amazing session that ended. 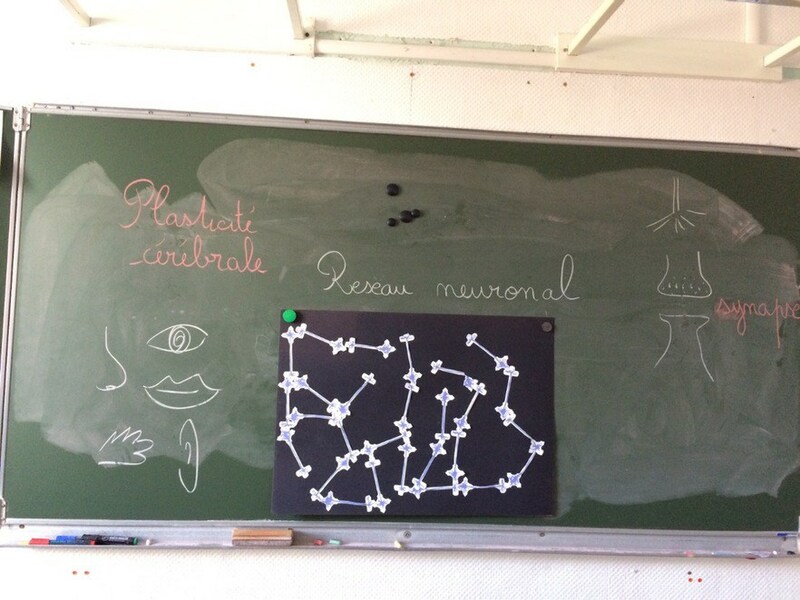 During the school christmas market, I discussed with some parents in a informal way and all came to say that children are now talking a lot about neurons and how the brain works. They are “into it” and we feel that they are interested. New questions are : why ? the playful way to teach ? because we talk about them ? Children are placed in groups of 6 or 5. They will discover the 6 basics emotions with the emotions games. Each group receive an emotion picture. They have to think in groups on what it could mean, then they exchange between groups. Emotions names came out and we write them on the main board. In a second time, eachgroups receive one of the emotion card, a vocabulary card, and a picture card. They have to make a story out of it and then make the rest of the class guess which emotions they are talking about. In a playful way, children used and review basic emotions. Collectively, the class shared this emotions game. Children will be able to play later with it. The game is going to go in each family one day after the other, a nice way to play in family and gain new vocabulary.